SKU: 260BP-D. 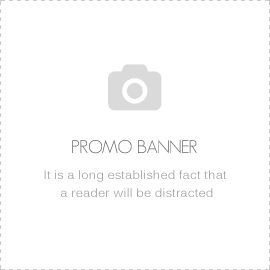 Categories: Speciality Display Cases, Button 72 Slot Display Cases. 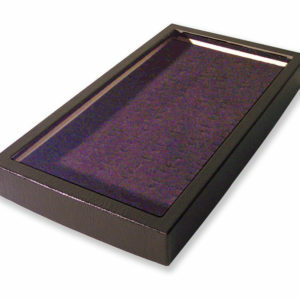 Case size 36.8 X 19.7 X 3.18 cm (14 ½ ” X 8” X 1 ½ ”) The case is cardboard with a black pebble grained leatherette covering and framed glass lid. The foam insert with velvet finish in Blue has 72 slots which are excellent for most rings even pin lapel badges; Sports team badges the possibilities are endless. 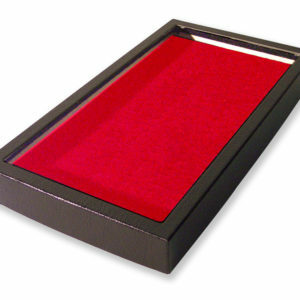 Case size 36.8 X 19.7 X 3.18 cm (14 ½ ” X 8” X 1 ½ ”) The case is cardboard with a black pebble grained leatherette covering and framed glass lid. The foam insert with velvet finish in Gray has 72 slots which are excellent for most rings even pin lapel badges; Sports team badges the possibilities are endless. 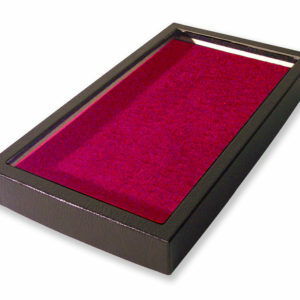 Case size 36.8 X 19.7 X 3.18 cm (14 ½ ” X 8” X 1 ½ ”) The case is cardboard with a black pebble grained leatherette covering and framed glass lid. The foam insert with velvet finish in Burgundy has 72 slots which are excellent for most rings even pin lapel badges; Sports team badges the possibilities are endless. Case size 36.8 X 19.7 X 3.18 cm (14 ½ ” X 8” X 1 ½ ”) The case is cardboard with a black pebble grained leatherette covering and framed glass lid. The foam insert with velvet finish in Red has 72 slots which are excellent for most rings even pin lapel badges; Sports team badges the possibilities are endless. 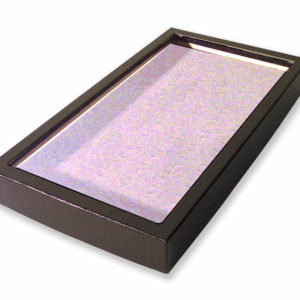 Case size 36.8 X 19.7 X 3.18 cm (14 ½ ” X 8” X 1 ½ ”) The case is cardboard with a black pebble grained leatherette covering and framed glass lid. The foam insert with velvet finish in Black has 72 slots which are excellent for most rings even pin lapel badges; Sports team badges the possibilities are endless.